Another great ten-week session with the [Ireland] Tyrone Donegal students has come and gone. I just want to pass along that several of the students told me how much they enjoyed being in your classes. Some of them mentioned how they thought it was such a good idea that there was only one instructor for all four courses. In fact, one found it hard to believe it would work any other way considering the assignments they had in the different courses and the wrap-up project at the end. Let me add to the student comments about the same instructor for all sessions. With the same group in all classes, you certainly got to know the stars and those that needed some extra attention or motivation. I think that is important considering the amount of money Tyrone Donegal pays for the entire program (all 20 to 26 weeks here and in Ireland) and the fact that they do purposely select a few who need that special instructor assistance along the way. It is fundamental to the thrust of the program and I think we have had one or two special students included every year. Thank you for the help you provided to me here and there during the program concerning disciplining, out-of-class arrangements involving student assignments, materials and all the other fun things when our paths crossed. I also appreciated you allowing me to sit in the classroom now and then. 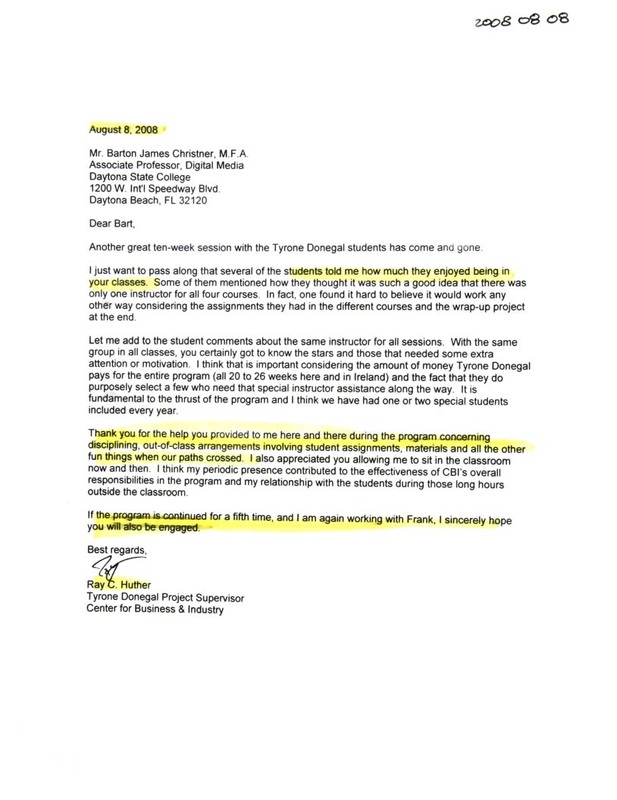 I think my periodic presence contributed to the effectiveness of CBI’s overall responsibilities in the program and my relationship with the students during those long hours outside the classroom. If the program is continued for a fifth time, and I am again working with Frank [Mercer], I sincerely hope you will also be engaged. Excerpted from emails dated: March 31, 2008, July 10, 2008, and June 2, 2008.